Scott McLaughlin scored his seventh win of the season in the #17 Shell V-Power Racing Ford Falcon today in the first race of the Ipswich SuperSprint at Queensland Raceway. It’s his 23rd Supercars victory in a career. It helps DJR Team Penske’s driver to extend the championship lead after nineteen races to 143 points (2183:2040) in front of Triple Eight/Red Bull Holden’s Shane van Gisbergen, who finished second today. Craig Lowndes completed the podium in the #888 Autobarn Lowndes Racing Holden Commodore, ahead of Jamie Whincup (Red Bull Holden) and Fabian Coulthard (DJR Team Penske). 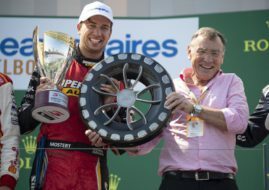 As the drivers of two greatest teams (DJR Team Penske and Triple Eight) filled the first five places, the best of the rest was Chaz Mostert in the sixth place in the #55 Tickoford Racing/Supercheap Auto Racing Ford. David Reynolds (Erebus Holden), James Courtney (Mobil 1 Boost Mobile Holden), Michael Caruso (Drive Racing Nissan) and Nick Percat (Summit Racing Holden) completed the top 10. Scott McLaughlin started from pole position, for the ninth time this year, and converted his starting position into a dominant victory. He controlled the 39-lap race from lights to flag and crossed the finish line more than four seconds ahead of SVG. The second, 65-lap long race, is scheduled for tomorrow.